At its peak the fire was so intense it formed a 150-metre-high tornado of whirling heat, flame and smoke. It was January and the owners of Laharum Olive Grove – Deirdre Baum, her husband Richard and their two boys – were on holiday at the beach. 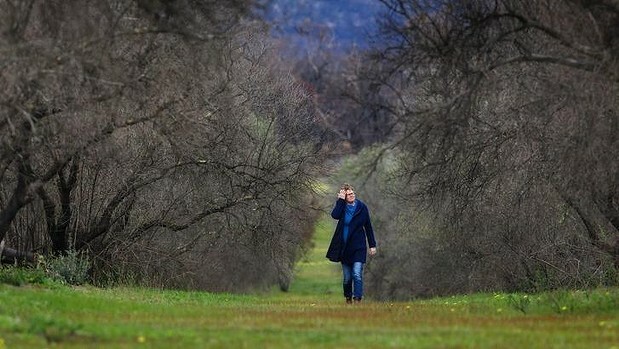 Bound on one side by the imposing Mount Difficult Range in Grampians National Park, their 120-hectare property forms part of one of the largest and oldest olive tree estates in Australia, planted by Jacob Friedman in 1943. The Baums exchanged city life for their relatively small olive tree plot nine years ago and had already endured flood. But this was their first fire. Neighbours updated them as the flames rolled over the hills and swept through their property. There was nothing they could do. They arrived home to a scene of charred devastation. Fire fighters had saved the house and the newly built restaurant, and the family’s two miniature goats and two alpacas were still alive too (although one had its ears badly singed). But the flames spared only 300 of their 11,000 olive trees. The worst of the damage happened near the back fence, where the heat tornado ripped through a 15-by-15-tree square of premium slow-growing Verdale olives, celebrated for their low-yielding but high quality fruit. “It’s incredible what it did to the trees,” recalls Deirdre Baum of the moonscape that greeted her. More than six months later a covering of green now hides most of the sandy, ashen soil and the hardy, 71-year-old trees – many of which have received a severe pruning – are already sprouting new growth. Baum is confident they will bear fruit again within five years but this season they were able to make only 700 litres of organic extra virgin olive oil. It will be years before they return to their normal yield of 8000 litres so, at least for now, the restaurant is keeping them alive as a business. Meanwhile, back in the city, another challenge is looming for Baum and other extra virgin olive oil producers like her. On June 27 the Legislative and Governance Forum on Food Regulation, made up of Commonwealth, state, territory and New Zealand food ministers, announced the official beginning of a new food labelling initiative, known as the Health Star Rating (HSR) system. Similar in look to those energy rating stickers you see on washing machines and fridges, it’s designed to give consumers an accurate picture of what’s inside their breakfast cereal packets and snack bars – specifically, the energy, saturated fat, sugars, sodium and nutrient content. Food is divided into six categories and products are given star ratings out of five for their health and nutritional value (fresh fruit and vegetables are exempt). Sanitarium and Woolworths were among the first to sign-up to the voluntary five-year scheme, which will be reviewed in 2016. Health professionals regard it generally as positive news in the fight against obesity and a strike back by regulators against the confusing proliferation of (often dubious) health and nutritional claims made on food packaging. And, given earlier controversy when the HSR website was abruptly taken down by the Assistant Health Minister Fiona Nash and her then-chief of staff, Alastair Furnival, who Fairfax Media reported had links to the junk food industry, those close to it must be particularly pleased that it’s made it this far. But when extra virgin olive oil producers ran their product – long associated with the healthy Mediterranean diet – through the HSR calculator many were surprised and alarmed by how low it scored. On par with heavily processed margarine at 3.5, extra virgin olive oil scored half a star worse than canola oil, a much cheaper and highly refined alternative. Leading the olive oil revolt is Rob McGavin, CEO of Victorian companies Cobram Estate and Boundary Bend, which grows and supplies 65 per cent of the country’s olive oil stocks, making it the largest producer in Australia. McGavin says the system doesn’t take into account the health benefits of extracting fats and oils mechanically (by pressing) compared to refining processes, which generally apply heat and chemicals. Also, the system only looks at saturated fat, without taking into account others including trans fat, mono-unsaturated and polyunsaturated fats. This shows a fundamental flaw, he argues, throwing doubt over the system’s credibility as a whole. Ultimately, the government wants us to make healthier food choices and the HSR system gives consumers a relatively simple tool for understanding the nutritional value of food products. It should be used in conjunction with the Australian Dietary Guidelines, it argues, “one of the key sources of information for consumers regarding overall nutrition.” Meanwhile, an accompanying social marketing education campaign is also close to being finalised. At the University of Melbourne, Dr Gyorgy Scrinis, a lecturer in Food and Nutrition Politics and Policy, spends a lot of time closely following the politics of food. He’s the author of Nutritionism: The Science and Politics of Dietary Advice, whose central thesis is that by breaking down food into individual nutrients we narrow and in some cases distort our appreciation of food quality, so even highly processed foods may look healthy depending on their content of “good” or “bad” nutrients. In short, perhaps we can’t see the forest for the trees. He characterises the current proliferation of health and nutrition logos, claims and counter-claims as a battle between food companies on the one hand, and government regulators and public health experts on the other. Instead of simply disallowing all of food companies’ nutrition and health claims, he says, the HSR system is an attempt by government regulators to balance these claims out with counter-messages indicating the relative healthfulness of foods. Because the HSR system has a reductive focus on a few nutrients and food components it does create anomalies, he says, noting that some highly processed foods score relatively highly compared with minimally processed foods. Issues arising from government health labelling systems is not isolated to Australia. In June last year Britain launched a similar “traffic light” health rating system, which labels food red, amber or green depending on their fat, salt and sugar content. The London Telegraph reported that Italy then complained to the European Union over the labelling system’s treatment of several foods it traditionally produces, including Parmesan cheese, salami, prosciutto ham and high-grade olive oil – all receive “high risk” red lights – putting at risk some €200 million (A$286 million) in lost sales). Then, according to an AFP story in March, Italy’s Agriculture Minister Maurizio Martina vowed to use his country’s current turn as EU president to pursue a campaign against the British labelling laws. Lucinda Hancock, an accredited nutritionist and the Victorian executive officer of Nutrition Australia, the country’s peak nutrition education body, says she understands the broad aim of the Health Star Rating but is concerned that the formula doesn’t give as much attention to the positive nutritional value of vitamins, minerals and antioxidants, nor the level of processing an item has undergone. A more sanguine view on the HSR system and extra virgin olive oil comes from Alan Barclay, an accredited practising dietitian and spokesman for the Dietitians Association of Australia, the nation’s peak body for dietetic and nutrition professionals. The system may, for the time being, be voluntary but olive oil producers such as Rob McGavin feel compelled to be involved, seeing it as an issue of trust with consumers. Back at Laharum Olive Grove, this is the first Deirdre Baum has heard of the HSR system. She seems nonplussed. It will be a few years before their trees are ready to produce enough for a bottling run but supermarkets aren’t really their thing, anyway.